Work with the AIMC to establish math circles in your community. For students rising to grades 7-12. FREE!! This residential camp will be at the Navajo Preparatory School in Farmingron NM from June 2-8. Application and Tentative Schedule(click, MS Word documents). Applications due May 5. Math Circle Night for Parents, Staff and Students @ Tuba City Boarding School Cafeteria on January 29, 2019 from 6-7pm. Contact Regional Coordinator, Craig Young for more details about the event. Flyer here.. Math Circle Night for Parents, Staff and Students @ Tuba City Boarding School Cafeteria on October 30, 2018 from 6-7pm. Contact Regional Coordinator, Craig Young for more details about the event. Flyer here. The 4 Corners Math Teachers’ Circle met 5-8PM on October 24, 2018 at Navajo Preparatory School. Topic was “Fractals with Adding Machine Paper.” Contact Regional Coordinator, Donna Fernandez for more details. Here is a flyer to share with colleagues! May 28-June 2. Grades 7-12. Prepare for great fun! Application period is now closed. Prepare yourself, campers, for a GREAT time. Our very own Tatiana making news by sharing great math with great students. See this link, from the Navajo-Hopi Observer for details! The AIMC’s Henry Fowler and Bob Klein, together with Sally and Perfelia Fowler, began work with the staff at the Kennedy Museum of Art, to co-curate a Fall 2019 exhibit that highlights connections between the Kennedy’s extensive 700+ collection of Diné weavings and the tapestries of mathematics. Details to follows, though pictures can be found on the Our Stories page. Many thanks to the amazing staff at the KMA for their generous willingness to share and to create together. Dr. Henry Fowler in Scientific American. Ms. D. Fernandez of Navajo Prep will be hosting a Fall MTC workshop on Saturday, November 11 from 9am-3pm. The AIMC and New Mexico Math Circles Collaborative are supporting the event that is open to teachers of all grades 5-12. Certificates of participation will be provided to all teachers. RSVP to Ms. Fernandez (email dfernandez at navajoprep followed by the dot com). To be alerted to this and future events, please see our instruction sheet below for signing up for our text-messaging alert system from Remind.com (here, sign up for one or more states). Exploding Dots! at Santa Fe Indian School. Contributing to Global Math Day! The Mathematics Department at Santa Fe Indian School, in partnership with the Alliance of Indigenous Math Circles, joined 1.7 million math fans around the world engaged in the Global Math Project by sponsoring a free Exploding Dots workshop on Saturday, September 30, 2017. The event was attended by 10 teaching professionals from 8:00-12:00 in the MST Lecture Hall on the SFIS campus. The Navajo Nation’s FIRST Math Teachers’ Circle! You are invited! The AIMC was proud to support the first meeting of the Navajo Math Teachers’ Circle on Sep. 23 (Saturday) in Kayenta, AZ at Monument Valley High School. Topic was “Number Sense across the Grades” and was facilitated by Drs. Pam Smith and Anne McCarthy of Fort Lewis College (Colorado). The Alliance of Indigenous Math Circles Teachers’ Immersion Workshop! You made history! Thanks to the participants of the July 13-15 Summer Math Teachers’ Circle Immersion Workshop at Greyhills Academy in Tuba City, AZ who made it a great success. Some materials and links are below. Please contact if you have questions! Thanks also to the Carnegie Corporation of New York for their generous support. The Global Math Project: Homepage. Join now! Free! Mathematical Origami: Constructions (PDF, 65 KB); Sonobe Units (PDF, 42 KB); Minako Flowers (PDF, 28 KB); Magic Pinwheel (PDF, 63KB); Star Kusadama Ornament (PDF, 39KB); Zig-Zag Phizz Units (PDF, 61KB). Thanks to Amanda Serenevy and the Riverbend Community Math Center for these! 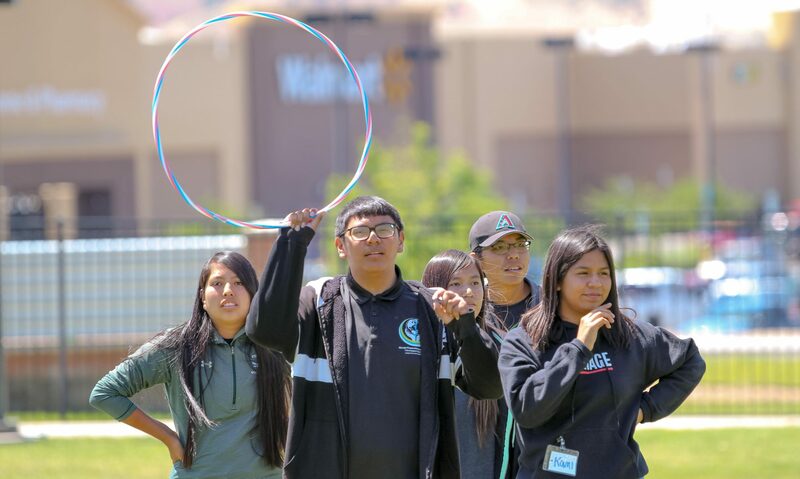 The following videos describe our work on the Navajo Nation with the Navajo Nation Math Circles project. George Csicsery of Zala Films have compiled these video shorts from the Navajo Math Circles documentary film shown on PBS.